Video games are unique in nature. They are cross-discipline, iterative and interactive. Creating such products requires suitable methodologies. Cross-discipline – they need expertise from various fields, including art, design and programming. Iterative – great gameplay demands continual adjustments. Interactive – the user is at the centre of the experience and the developer does not fully control the flow. Due to this singularity, appropriate working practices are essential when developing games. Yet production does not seem very popular. It is easy to find exciting articles explaining art techniques, design ideas or programming tricks. Not so much with production. Nobody wants to read about boring spreadsheets, right? Fact is, production is not just crunching numbers, and it is far from boring. Have you ever analysed goals to prioritise work? Or organised information to coordinate effort? Then you are already doing production. But certain ways are more effective than others. Part of the role of the producer is to know how to maximise the value of the product and the efficiency of the development. These articles will demystify production to manage game projects easily. The target audience is wide, from serious amateurs to seasoned creators. The content will benefit most to teams with little experience, facing daily challenges. So, why should you care about production? A functional production framework gives all the tools to drive a game development. It handles the information to make educated decisions. Good production is essential for controlling the progress. This materialises as a collection of project management assets. Including planning documents, goals definitions, tracking spreadsheets, etc. It allows easy access to all the important information and it is key for confidence as it helps minimise the risks. The quality of the project management directly affects the global efficiency. Therefore, it impacts the value of the final result. A great new idea could make a core gameplay mechanic more fun – can we absorb the changes, or do we have to lose another feature? A functionality needs to be revisited and is causing tasks to slip – do we review the workload, or should we compromise on content? These are tangible questions developers have to answer on a regular basis. A practical organisation of critical data allows calibrating the product. Which means finding a balance between scope, time, budget and quality. Creating a video game is an iterative process and it is important to be able to continually adjust the project variables. Different timescales require different reasoning to capture the appropriate data and allow access to the relevant information. It is important to set intermediate achievable goals. Production gives an understanding of the global situation. Short term; that is the day-to-day activity. Who is doing what at this moment? Are there any blockages to escalate? What will the teams be doing in a week? Information should be fluid to ease collaboration. But also sufficiently quantified to allow reasonable reporting. Middle term; that is more the roadmap-level planning. What are the goals of the current set of iterations? What will be the state of progress in a few months? What elements of gameplay will be available at each stage? This includes information related to milestones and deliveries. But also, opportunities for project reviews and calibration. Long term; the million dollar question. Or, more like the 10 or 50+ million dollars question, depending on the project. Basically, when will the game be finished? Will the product meet the expectations, regarding quality and content? It is decisive to build tracking early in the development, as more historical data will increase the accuracy of future predictions. Efficiency is at the centre of project management principles. Effective methodologies tend to focus more on the ‘doing’ and less on the ‘proceeding’. There needs to be a foundation for organisation. Team structure or reporting channels are important elements of procedures. But there will be situations that do not fit. The keyword is pragmatism: adapt so that processes always support the action, not get in the way of the work. Team members communicate on a daily basis. Facilitating communication has potential to boost productivity. If information goes through many intermediates, the final recipient gets a distorted message. Efficient communication requires structure! Such as properly sized channels to avoid bottlenecks. Or clearly defined processes to escalate problems. Instant messaging is not to be treated the same as meeting minutes or internal newsletters. Coordination is equally important. Coordination of work through planning, of course, but also coordination of the resources of the infrastructure. Simple things like tools to organise meetings and book rooms can go a long way and have a real impact on efficiency. Every initiative that can help minimise downtime and solve blockages should be considered. The producer should identify and implement automation where relevant. A well-designed project environment is a catalyst. Production organises and facilitates work. It helps to support development through all the aspects presented in this article. Part of the role of production is to measure work. Many methodologies exist to quantify the features or tasks during the valuation process. The data is used for tracking purposes via a reporting solution. But regardless of the implementation details, visualising progress is an immense source of satisfaction. Even simply ticking things off a list feels good! Completing goals regularly is a potent element of motivation for all stakeholders. And knowing that the project is moving closer to the final objective has a huge impact on team morale. Modern project development methodologies and principles focus on supervising the product, instead of administering the people. That is, in essence, delegation of responsibilities. It can be counter-productive to micromanage employees; let them take ownership of issues and come up with solutions. When collaborators are empowered, at their respective level, every team member is more committed. This can be reflected in the production processes, to promote initiatives while remaining in control. All fragments compiled in a handy ‘reminder’ sheet! Add this cheat sheet to your notebook and start a collection: more to come! 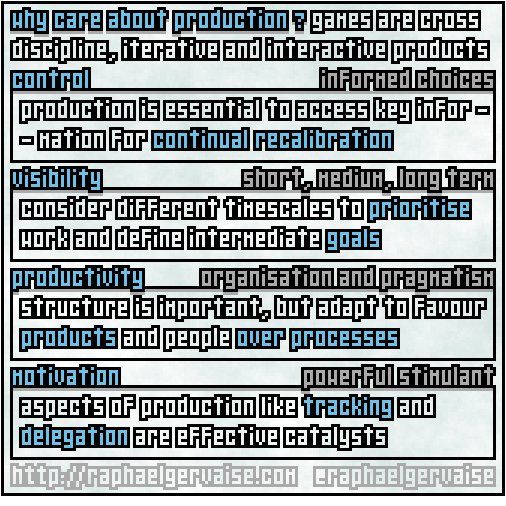 This first article was necessarily a bit abstract, to set the context and scope of future publications; in the upcoming posts, we will be looking at more tangible elements of game development: production artefacts and project management assets, but also overviews of different methodologies, calibration checklists, and much more.